Matthew Morgan should start at full-back for Wales in the Six Nations, according to legendary former wing Shane Williams. Injuries to Leigh Halfpenny and Liam Williams have depleted Wales' options at 15. Williams believes Bristol's Morgan - who will join Cardiff Blues at the end of the season - can fill the void. 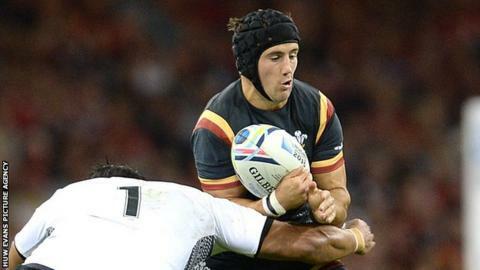 "I hope Morgan gets a chance because he's got something special," Williams told BBC Wales Sport. "I played with him at the Ospreys and I saw what kind of a player he is, particularly in attack. "He's done well at Bristol and grown as a player, so he needs an opportunity I think." Two other full-back options for Wales, Gareth Anscombe and Hallam Amos, have returned to action from injury. Anscombe was a second half replacement in Cardiff Blues Challenge Cup defeat at Harlequins while Hallam Amos started as Newport Gwent Dragons beat Castres in the same competition. Morgan, 23, has won five caps for Wales and hopes his move to the Blues will enhance his international credentials. The former Osprey has spent the majority of his career at fly-half, but Wales and the Blues both see the diminutive playmaker's long-term future at full-back. He started at full-back against Fiji at the 2015 World Cup, one of two appearances for Wales in the competition. Wales head coach Warren Gatland will name his squad for the Six Nations on Tuesday, 19 January. Halfpenny is expected to miss the entire competition, while Williams, Anscombe and Amos are hopeful of returning to fitness by the end of this month. "A lot of players are playing well at the moment," Williams added. "Sam Davies has done well at the Ospreys and I'm a big fan of Matthew Morgan. "When he played at the World Cup he played well, particularly against Fiji, and he's got something different to other players. "So hopefully he'll get the opportunity, but it would be nice to see the likes of Leigh Halfpenny, Liam Williams and Hallam Amos back as soon as possible."